Modern prog/power metal characterized by technical ability, a fervency for volume and a passion for power. 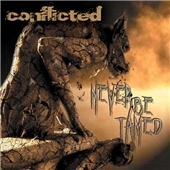 That´s what the info sheet states about Canadian band CONFLICTED. The band consists of four-octave vocalist Jason Orton, the neoclassical inclined guitarist Mark Owen, the symphonic keyboardist Ron DeCoste, metal bass man John Kolodziej and experienced drummer Corey Stoll. They have two EPS under their belt, plus a couple of Canadian awards. They must be doing something right being signed to Lance King´s Nightmare Records.